This blog post is based on an interview that was conducted in 2017 between curator Catherine Forge (Museums Victoria) and trout farmer Sally Hall for the Invisible Farmer Project. Using excerpts from this interview, Catherine reflects on meeting Sally and provides an overview of Sally’s journey into farming, her connection to the outdoors and her experiences of being a farmer. 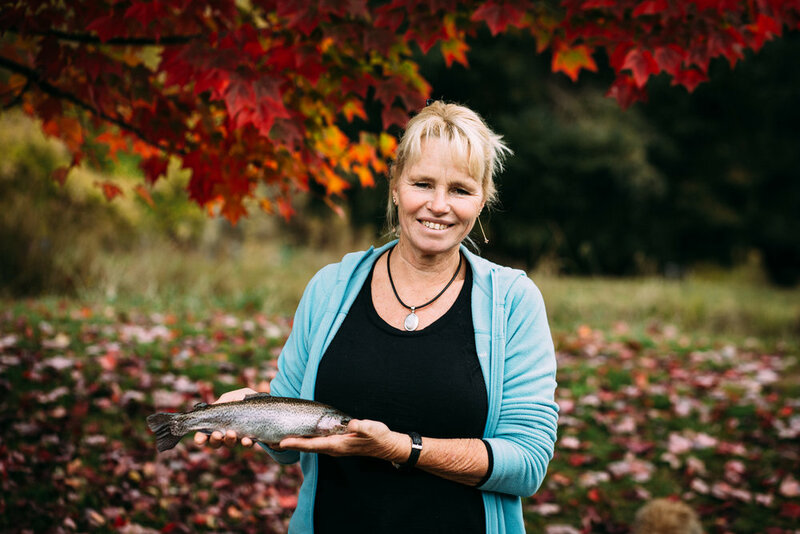 Sally Hall holding a trout on her farm, Mountain Fresh Trout and Salmon Farm, Harrietville (Victoria), 2017, Photographer: Catherine Forge, Source: Museums Victoria. In May 2017 I packed my camera and audio recording equipment into the car and travelled from Melbourne to the small Alpine township of Harrietville, Victoria, to interview trout farmer Sally Hall. Sally’s family farm, Mountain Fresh Trout and Salmon Farm, is located in a scenic part of the world – right at the foot of Mount Hotham and Mount Feathertop, with fresh water streams and abundant greenery. As I pulled into the driveway I was immediately struck by the farm’s natural beauty; autumn leaves radiated bright red and orange, water gently trickled in the nearby streams and Sally emerged from her landscaped garden to greet me with a welcoming smile. 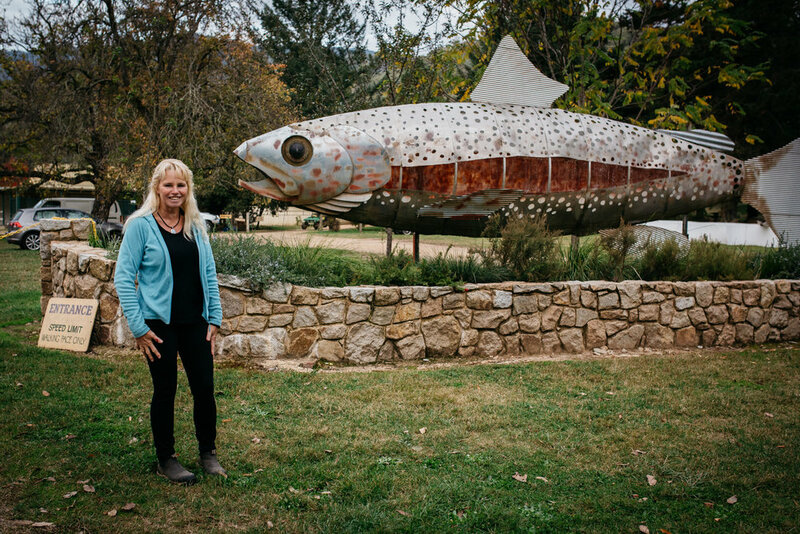 Sally Hall standing at the entrance to Mountain Fresh Trout and Salmon Farm, Harrietville (Victoria), 2017, Photographer: Catherine Forge, Source: Museums Victoria. Sally informed me that the sculptured fish in the backdrop was previously used in the 2006 Commonwealth Games to represent the country of Cyprus. Pouring me a cup of tea as we prepared to start the interview, Sally confessed to feeling a tad nervous about sharing her story, mainly because she didn’t think she deserved the attention. ‘My story isn’t that interesting or important’, Sally informed me, and admitted to being a bit confused as to why I would want to interview her. This a common scenario when interviewing women who farm; many women tell me that they share a similar fear about being interviewed, and I cannot tell you how many times I’ve heard phrases such as, ‘I don’t feel my story is important’, ‘maybe you should speak to my husband/partner instead’ or ‘I don’t know why you’d want to interview me.’ And yet, every woman that we have interviewed for the Invisible Farmer Project has had an incredible story to share, and I firmly believe that all of these stories are of great significance. After all, women contribute half the world’s food and fibre and play a vital role on farms across Australia. Their stories, and Sally’s story, deserve to be told. Sally and her husband Peter Hall on their wedding day, 1980, Image: supplied by Sally Hall. 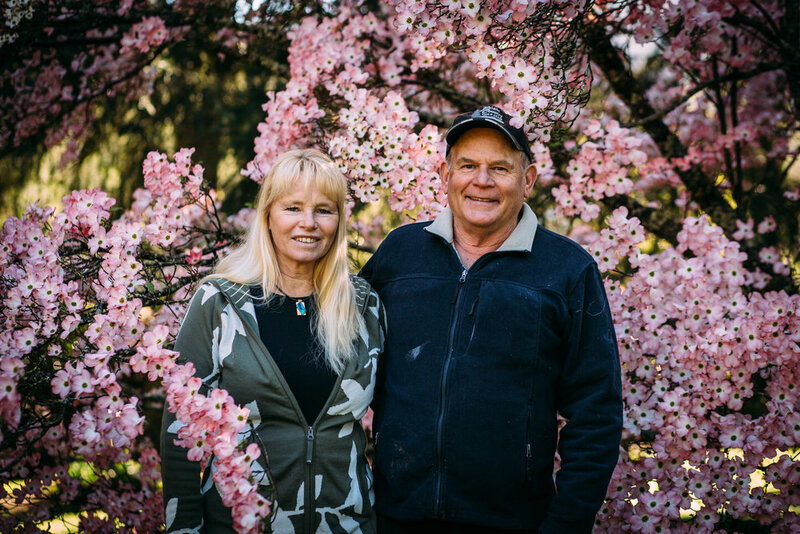 Sally Hall with her husband Peter Hall on their trout farm, Mountain Fresh Trout and Salmon Farm, Harrietville (Victoria), Spring 2018, Photographer: Catherine Forge. We ended up doing seven years of farming there, through lots of droughts and the arrival of two children at the time. I mostly tried to be a good wife and a good mother to our two young children, as well as looking after the staff. I did as much farm work as possible. It was a more male-orientated job back then, but I did whatever was needed of me: fencing, truck driving, sheep work, grain carting and whatever came my way. There were parts of this life that I loved. I loved the great expanse of the remote outdoors, the sense of community, the church and its’ people and the physical work. But droughts were at times severe. We were in marginal country, right near the emu-proof fence, where you would be lucky to get a few bags an acre. And then the interest rates went to 22 per cent and that was the end of us farming in Wialki. Sally’s husband Peter, daughter Kathy and son David on their farm in Wialki (Western Australia) in 1987. I had asked Sally for some photos of herself during these years, but she wrote on the back of the photo: ‘no photos of me as I was always the camera man.’ Image: supplied by Sally Hall. I found that I was drawn to opals and jewellery making, and that I really enjoyed working on new jewellery creations. It was a completely different world to the remote farming world that we’d previously inhabited. Rather than being outdoors on the land, I was working in an office all the time making jewellery and cutting opal. 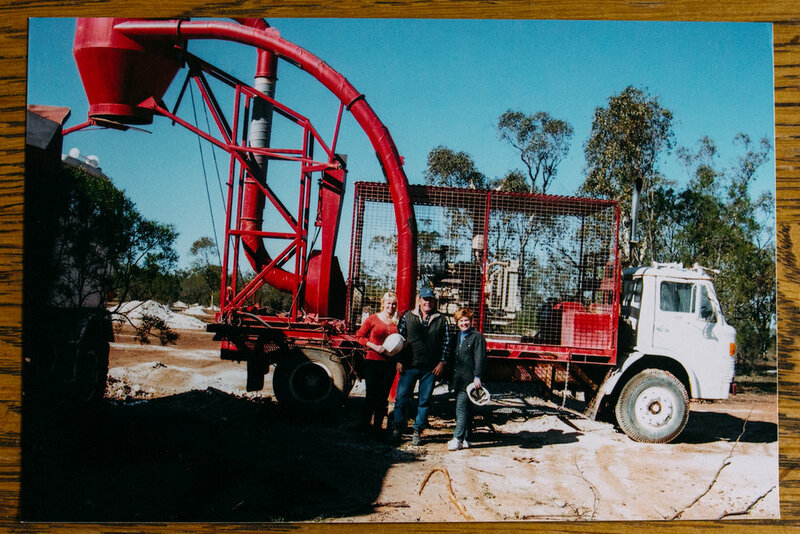 Sally Hall, Peter Hall and a friend with a piece of mining equipment, Lightning Ridge (New South Wales), 2002, Image: supplied by Sally Hall. Opals ended up becoming a really big part of my life. I opened a retail outlet under the name “Everything Opal” and had five staff and then travelled around Australia six or seven times a year, for ten days at a time wholesaling. When I reflect on my opal life and my farming life, I feel like there’s two different versions of me. But even though I’m a farmer right now, I still love opals and continue to occasionally make jewellery. The shopfront window of Sally’s jewellery outlet, “Everything Opal”, Lightning Ridge, 1998, Image: supplied by Sally Hall. Sally and her family ended up staying in the opal mining business in Lightning Ridge for 18 years (1987-2005). During this time, Sally reflects that ‘farming was still always in our blood’ and it wasn’t uncommon for dinner table conversations to turn to the topic of farming, and how to get back into it. In the end it was the additional income provided by Sally’s jewellery-making business that helped make it financially viable for the family to re-enter farming. A decision was made to purchase 4,000 acres of farm land around Narromine and Trangie, New South Wales, and Sally soon found herself balancing two different jobs – making opal jewellery and farming Angus beef and mixed crop varieties. Sally holding one of her opal necklaces, 2018, Photographer: Fiona McLennan. For the first five years, Sally and Peter travelled the long four-hour drive from Lighting Ridge to manage the Narromine and Trangie farm sites over weekends while they continued to mine, cut opals and sell jewellery during the week. Eventually, however, they decided to discontinue with the opal mining completely and transition back into full-time farming. Relocating to live permanently in the dry and remote landscape of Narromine and Trangie, Sally dedicated herself once again to farm life. During this period Sally and Peter diversified the farm by planting 1,200 olive trees. They also started to produce their own olive oil. Workers hard at work on the olive groves, 2018, Image: supplied by Sally Hall. My indoor duties were less intensive without the children home, so I spent a lot of time doing outdoor work in those years – anything from fencing to tractor driving to looking after the Angus mothers and their variously aged baby calves. I suppose it wasn’t what you would describe as an easy life. The work was ongoing and there were always things that needed to be done. But I really liked the outdoor work and the physical work. There’s something about being outdoors working the land that I can’t describe. It gets under your skin, and it’s where I feel I belong. It’s so beautiful being outdoors too. Sometimes at night time in Narromine and Trangie you could look up into the sky and see hundreds of stars shining. And at daytime the sun would belt down on your back, and the sky would be the most brilliant shade of blue. Yes, the outdoors is where I like to be – under the open skies, on the land. Sally Hall feeding trout, Mountain Fresh Trout and Salmon Farm, Harrietville (Victoria), 2017, Photographer: Catherine Forge, Source: Museums Victoria [MM 145578: https://collections.museumvictoria.com.au/items/2241621]. Listening to Sally talk about farming in Western Australia and New South Wales, she described the colours of the Outback to me – the orange earth, the dry dust and the long empty roads that stretched out to the horizon. It all seemed so different, and so far away, from the lush, green and mountainous region that Sally now inhabits. ‘How did you make such a big transition – from farming cattle and crops in the Outback, to farming trout and salmon by ponds and waterways?’, I asked. We were down here at Mount Hotham on a family skiing holiday actually. And then we spotted this trout farm as we drove along the Great Alpine tourist road and saw the “For Sale” sign. It was love at first sight, and at the time we agreed – my husband, my son and my son’s wife – that this would be such a lovely place to come to. So we sold everything from Lightning Ridge, Narromine and Trangie and came here, and we’ve been here for eight years now. Sally Hall with her dogs and chooks, Mountain Fresh Trout and Salmon Farm, Harrietville (Victoria), 2017, Photographer: Catherine Forge, Source: Museums Victoria. I think the reason that we loved it when we came here was that it was green, and there was water everywhere and rivers and freshwater as opposed to Western Australia where it was salty water. It was such a beautiful, beautiful green place, and all the autumn leaves too. Yeah, it was just a completely different climate to our previous farms in Western Australia and New South Wales. Sally Hall fishing for trout with a bamboo fishing rod, Mountain View Trout and Salmon Farm, Harrietville (Victoria), 2017, Photographer: Catherine Forge, Source: Museums Victoria [MM 145580: https://collections.museumvictoria.com.au/items/2241623]. We have here 20 acres of beautiful, beautiful country with probably forty ponds on it, and sheds with ponds. Stony Creek comes into our place at the top corner and it gravity feeds right through our farm, putting water through all the fish ponds. And then after it’s settled for a while it goes back into the Ovens River out the front. It couldn’t be more beautiful here, especially the fact that it stays so green over summer too. I’d have to say that green is now my favourite colour! I just love it. I love the water and the freshness. 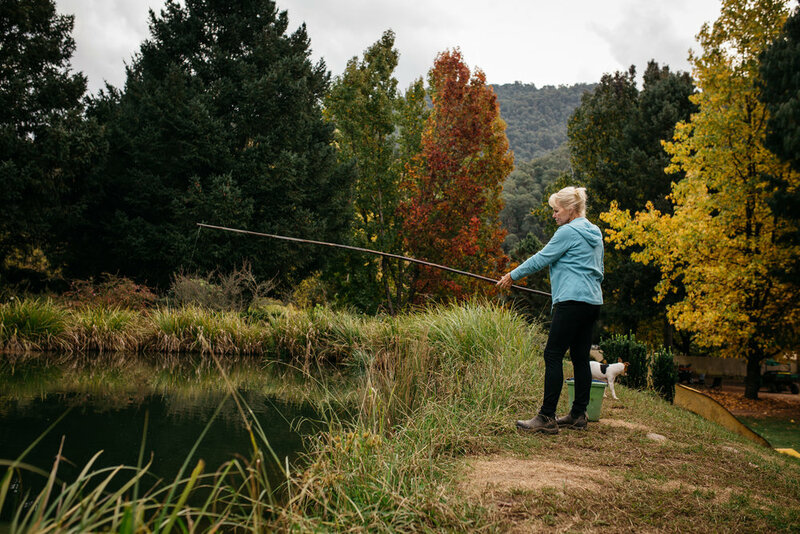 Sally Hall catching a trout, Mountain Fresh Trout and Salmon Farm, Harrietville (Victoria), 2017, Photographer: Catherine Forge, Source: Museums Victoria. With David doing the Uni degree in aquaculture there was the technical side already there. But I think because we’ve been farmers on and off all our life, it’s still animal husbandry and a lot of that is just born into a farmer really. You just learn it as you go. You see what needs doing. 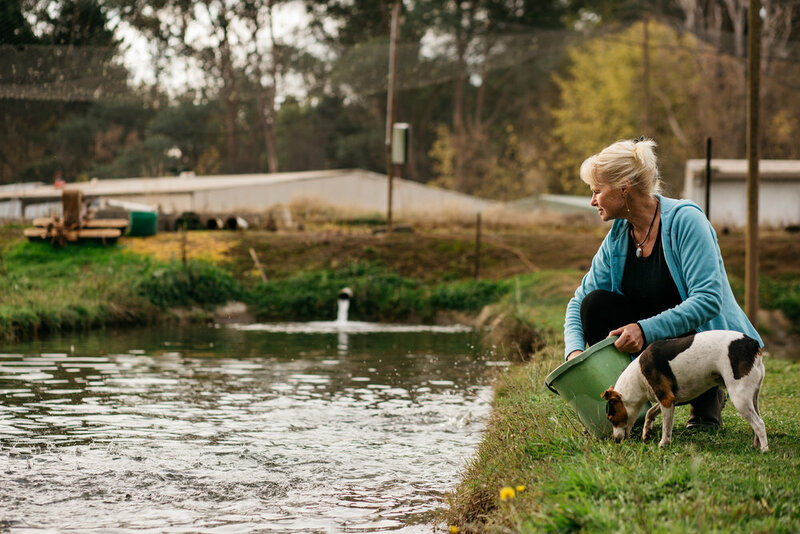 Sally Hall with her dog feeding salmon, Mountain Fresh Trout and Salmon Farm, Harrietville (Victoria), 2017, Photographer: Catherine Forge, Source: Museums Victoria. We’re growing about six or seven different varieties of fish now – rainbow trout, brown trout and brook trout, Atlantic salmon, cheetahs, tigers and golden trout. We have worked to make the gardens beautiful for the tourists that come here to fish, and we have invested in new equipment. On top of this we have grown our market and client-base and we are selling to a wide range of customers including other fish farmers, the Government, chefs and local restaurants. It’s been a lot of work to get the farm to where it is now, but it’s been worth it. What sort of farmer am I? That’s a really hard one! I’m just the back-up person really… I don’t think of myself as just being a ‘fish farmer’, like the men would, because I feel that I do all sorts of general things as well. Whatever needs doing in that particular month, I’m just there doing it. 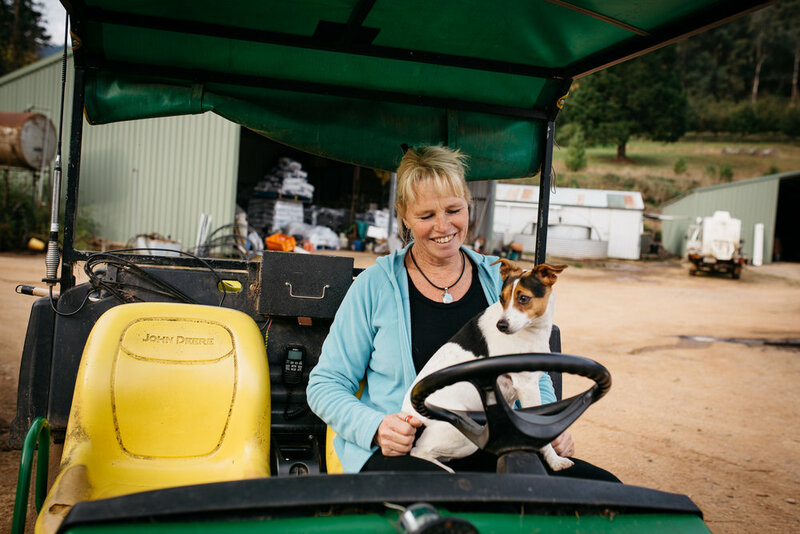 Sally Hall with her dog on a John Deere utility vehicle, Mountain Fresh Trout and Salmon Farm, Harrietville (Victoria), 2017, Photographer: Catherine Forge, Source: Museums Victoria [MM 145577: https://collections.museumvictoria.com.au/items/2241617]. I mean, I am a fish farmer, but I also worry about the garden, and do the paperwork and money things. I package fish, I make pâté, I mow grass, I do orders for restaurants and butchers and I sell fish weekly at various farmer’s markets. Yeah, I guess I’m a fish farmer, but it’s hard to define. It’s anything from chopping wood to moving the tractor to cleaning the shed to feeding the workers. I can’t quite put my finger on my role here on the farm – I’m sort of in all the jobs, where I’m needed. Talking to Sally about the multitude of diverse daily tasks that she performs on the farm, it is clear that her life’s work is dedicated to her farm and family, and that she plays a pivotal role in keeping the farm running. Yet by initially describing herself as ‘just a back-up person’, I couldn’t help but feel that Sally was inadvertently under-valuing her importance and her role on the farm. Sally is not the first woman that I’ve interviewed who has referred to herself as the “back-up person”, “helping hand” or the “just the Farmer’s Wife.” While these are commonly heard terms, I worry that by using them to describe their role on the farm, these women are accidentally sending a message that their work is somehow less important or less worthy than the work of their male counterparts, which clearly isn’t the case! Sally Hall with a juvenile fish, Harrietville (Victoria), 2017, Photographer: Catherine Forge, Source: Museums Victoria [MM 145582: https://collections.museumvictoria.com.au/items/2241626]. Sally Hall feeding chooks on her farm, Harrietville (Victoria), Photographer: Catherine Forge, Source: Museums Victoria [MM 145576: https://collections.museumvictoria.com.au/items/2241610]. I think for women there is more than just the manual and physical work. There is a mothering role that continues on forever when you’re farming. I think farm women do both. They are quite capable of chainsawing and wheelbarrowing and doing all the physical work that is required, but they are also often called upon to do emotional and communication work, which is a different role altogether. I think with the men, there’s a lot of things that they can say to a woman that they won’t say to a man, so being the only woman on a team of men, I’ll often find myself in that mothering role too. Sally Hall with her son David and fish tanks in the background, Mountain Fresh Trout and Salmon Farm, Harrietville (Victoria), 2017, Photographer: Catherine Forge, Source: Museums Victoria. I’m a farmer, but I’m definitely also a mother on the farm. For a lot of farm women like me, there is always a lot of food involved. You do end up taking on that kind of nurturing role with all the staff that you work with – you make sure that they’ve been fed, and that they’ve got a cup of tea. You know, you make sure that they are okay and looked after. We eat together, always. So half a dozen of us will sit together. It’s always under the trees around tables, and that’s where we talk, where we plan what’s next, where we laugh, where we tell stories. It’s often around food that we have a chance to communicate. And these are my favourite times really. The link between producer and consumer is definitely there, especially when people have caught fish for themselves. I mean they catch their own fish, they are excited and then they come to the workbench and have it cleaned. They become a captive audience while I clean their fish, and they usually want to know all about your life and how you clean the fish and how you farm. They want to know all about the farming process, so you interact with the tourist at that level always, every day. 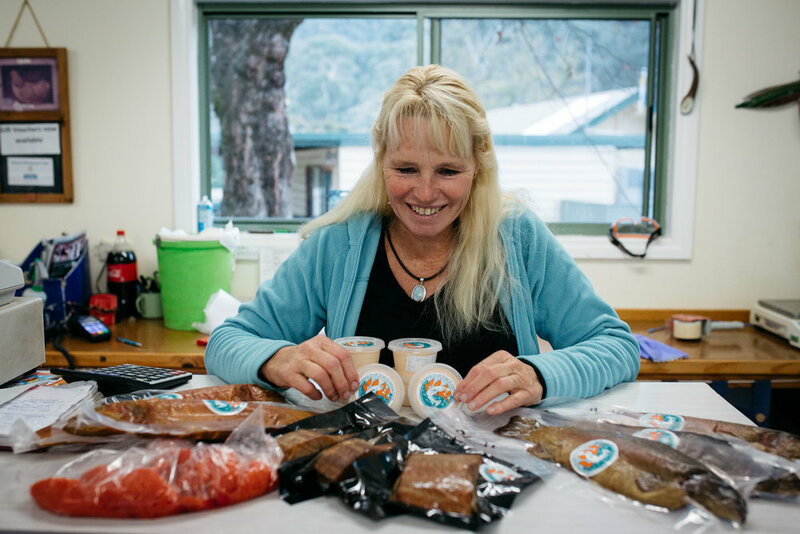 Sally Hall preparing fish in her Farm Gate shop, Mountain Fresh Trout and Salmon Farm, Harrietville (Victoria), 2017, Photographer: Catherine Forge, Source: Museums Victoria. Sally Hall at her Farm Gate shop where she sells produce directly to visitors, Mountain Fresh Trout and Salmon Farm, Harrietville (Victoria), 2017, Photographer: Catherine Forge, Source: Museums Victoria. Sally Hall selling fish at the Bright Farmer’s Market (Victoria), 2017, Photographer: Catherine Forge, Source: Museums Victoria. There’s money that comes from the farmer’s markets, but there’s also a lot of restaurant owners and butchers and various people wandering around fresh food markets looking for new ideas, or the next thing they’re going to put on the plate. So we do definitely pick up bigger customers by being out there and being seen. It’s great tapping into the city market, and also the local market. All the local restaurants use our fish. Their menus change all the time, but all the local people use it – the pubs and the butchers all round the region really. Produce from Mountain Fresh Trout and Salmon Farm, including the pâté that Sally makes with her mother, Harrietville (Victoria), 2018, Photographer: Fiona McLennan. Sally Hall and her mother Rita Baldwin serving customers at the Bright Farmer’s Market (Victoria), 2017, Photographer: Catherine Forge, Source: Museums Victoria. Mum moved to Bright 10 years ago, when we came here. She helps me make pâté (38,000 so far) and she comes to all the fresh food markets with me. She will pop into the farm any day and bring food and anything from town. She’s 86, so there’s obvious limitations, but she has always been there to mother me, even though I’m now 60. She gives plenty of love, comfort and care. Really our parents are our best advocates and I hope I can be that for my kids. Sally Hall and her mother Rita Baldwin at the Bright Farmer’s Market (Victoria), 2017, Photographer: Catherine Forge, Source: Museums Victoria. 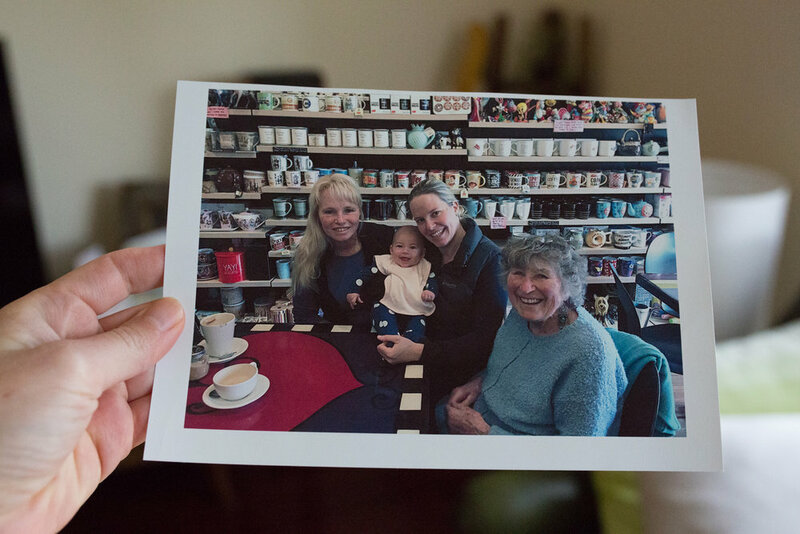 Sally spending some time with family - her mother Rita Baldwin, daughter Kathy and granddaughter Ella-Rose - at the Bright Lolly Shop, 2018, Image: supplied by Sally Hall. We are here to care for the land really. I feel like I look outside and I know what to do because it’s telling me all the time – you know, fix this, garden that, tend to that. I feel like when you’re a farmer the land owns you, if that makes sense. You can’t just walk away and take a week off or a month off. Water is always a problem. For us when the creek gets low we have to pump water from the Ovens River, so water is always a concern. Power is our next concern because we’ve got to run generators the whole time to pump water, so power is really expensive at the moment. Sometimes I feel we’re doing all our work just to pay the power bills. It’s an every day, all hours of the day job. I mean in summer we’re still checking fish of a night. It’s probably emotionally harder than it looks form the outside, in that you have to commit yourself to being here all the time. You’re definitely owned by the land in that way too. 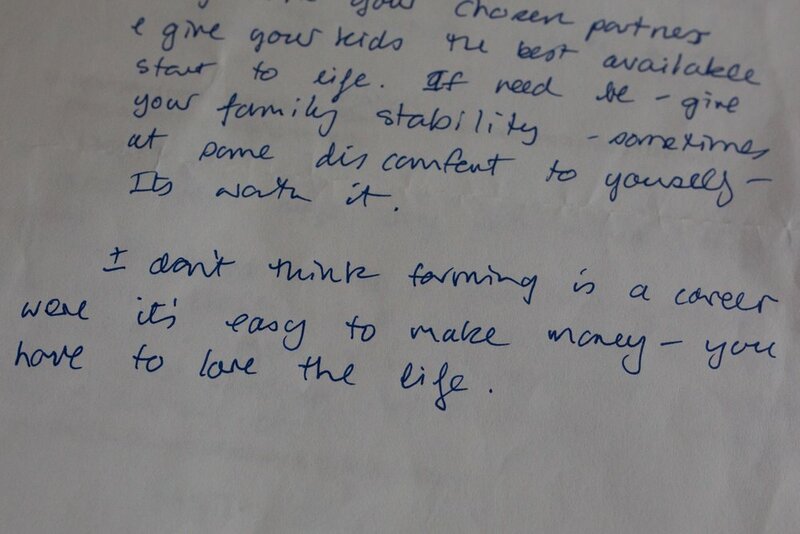 ‘I don’t think farming is a career where it’s easy to make money - you have to love the life’ ~ handwritten reflections on farming by Sally Hall, 2018. Flowers in bloom, Mountain Fresh Trout and Salmon Farm, Harrietville (Victoria), 2018, Photographer: Fiona McLennan. 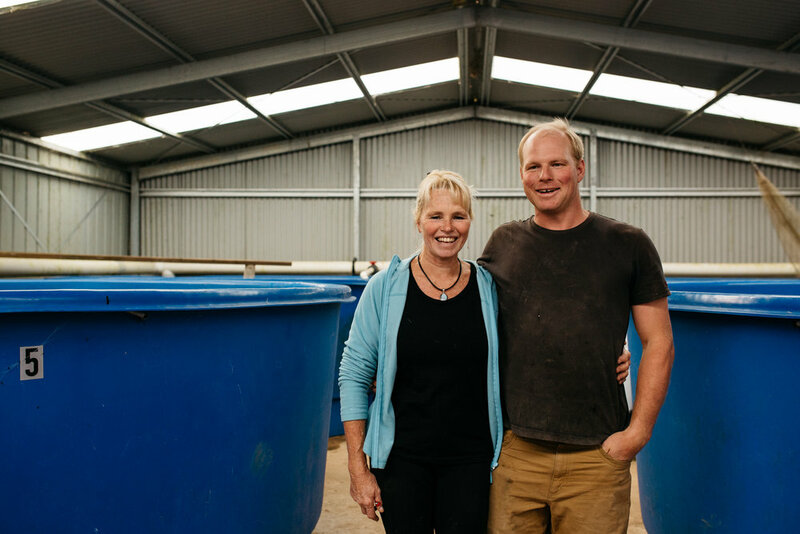 Sally and her son working with fish, Mountain Fresh Trout and Salmon Farm, Harrietville (Victoria), 2018, Photographer: Catherine Forge. Probably the only thing that has kept me together and continuing on when there’s been droughts and hard times and living in a caravan park for a year in Lightning Ridge with no money, I think being Christian has probably held me together, held my marriage together, helped grow my children into lovely kids. The second thing that has kept Sally passionate about farming is the connection to the outdoors, and the joy that she gets from being able to produce a fresh, high-quality product. I think being outside and the fresh air and a love for the land and animals.. and no traffic, no people, no rushing. It’s a very healthy lifestyle I feel. If I have to be inside and do bookwork for an hour I can’t wait to go outside and just do whatever’s out there, whether it’s the garden of the grounds. I also love that since we’ve been here the produce is a premium now. When we first came it was relatively run down and the fish were hungry and not in the greatest condition. But they are now all being bred by us, fed by us and couldn’t be in any better condition really, so people are getting really good quality produce, and I couldn’t feel more proud to feed it to them. 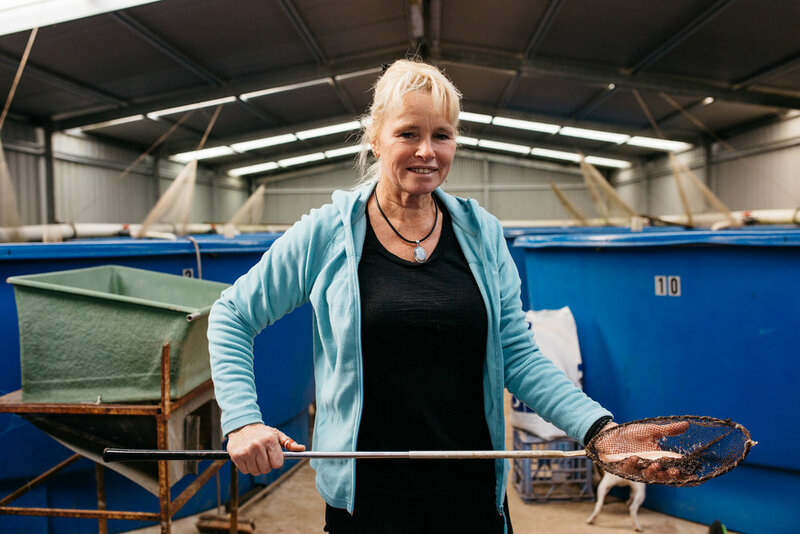 Sally holding a trout, Mountain Fresh Trout and Salmon Farm, Harrietville (Victoria), 2018, Photographer: Catherine Forge. Not only has Sally been a farmer over her career, but she has also managed and operated a small jewellery business, and through this work with opals she was able to provide the family with an additional off-farm income that helped facilitate their re-entry back into farming. 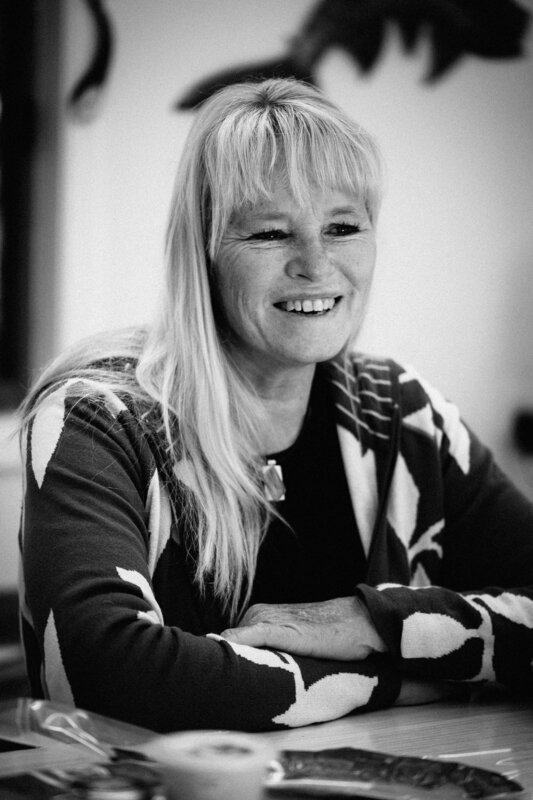 When I first visited Sally in 2017, we spoke about her passion for jewellery-making and how her opal business had been a big part of her life, but Sally confessed that she wasn’t sure if her previous career as a jewellery maker was relevant to her story as a farmer. ‘They both feel like two different worlds’, she had told me. Sally Hall reuniting with Catherine Forge in 2018, Mountain Fresh Trout and Salmon Farm, Harrietville (Victoria), 2018, Photographer: Fiona McLennan. When I visited Sally again in 2018, however, things had changed. Sally invited my mother and I into the Farm Gate shop and explained to us that she had just started to sell her opals alongside the fish products. As she showed us her beautiful opal jewellery and her homemade caviar pâté, there was something quite lovely about seeing these two worlds – her farming world and her jewellery-making world – come closer together. Sally Hall showing Catherine Forge her jewellery creations, Mountain Fresh Trout and Salmon Farm, Harrietville (Victoria), 2018, Photographer: Fiona McLennan. Women contribute to farms in so many diverse ways – they farm outdoors, indoors and in many cases they work off-farm to provide additional income that helps to sustain the farm. It is important to recognise and celebrate all of this work, because all kinds of farm work – from driving tractors to balancing accounting books to providing off-farm income – is work that contributes to the overall productivity and success of Australian agriculture. Sally Hall in her Farm Gate store with opals and fish in the background, Mountain Fresh Trout and Salmon Farm, Harrietville (Victoria), 2018, Photographer: Catherine Forge. Towards the end of our visit, Sally generously packed up some trout for my mother and I to take home. We said our goodbyes and as we drove out the driveway my mother turned to me and said, ‘wow, what a remarkable woman.’ Having met Sally a few times now, I have to agree that she is a remarkable woman, and yet I doubt that Sally would openly call herself “remarkable”, or expect to have her work publicly recognised. On the contrary, as we said our goodbyes, Sally confessed that it was unusual for herself to talk about herself, and that she had never really been in the limelight or shared her story with anyone beyond her immediate family. Yeah, when I think about the journey so far I’m definitely a farmer. When I look back at my career over the years I can now see that I can drive the tractor, I can drive the truck, I can do anything that men can do, except for the heavy lifting. Physically we’re not made the same really, but there’s mostly nothing that women can’t do. I think we’re essential. The men couldn’t do it without us. Sally Hall sitting behind her Farm Gate counter, Mountain Fresh Trout and Salmon Farm, Harrietville (Victoria), 2018, Photographer: Fiona McLennan. I wish to sincerely thank Sally for sharing her story with us, and for the delicious fish and homemade pâté that she generously provided on both visits. I’d also like to thank her husband Peter, son David, mother Rita and farm worker Jessie for welcoming us to the farm and showing us around. Finally, I want to thank my mother Fiona McLennan for volunteering her photographic skills to the project. Be part of the conversation and join in discussions with the Invisible Farmer Project on Facebook, Instagram and Twitter.